Drilling the perfect hole for your construction project is paramount when you want to make sure that the job is completed properly. USDiamondTool.com is proud to offer a wide variety of hole saws and hole saw bits, including bi-metal hole saw selections. 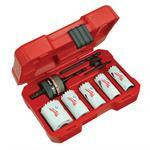 When you purchase these tools, you can feel confident that you’ll have everything you need to drill any type of hole. Additionally, we carry full hole saw kits that are ideal for individuals making their first investment in these saws. Our business carries hole saw bits, kits, and accessories that are perfect for professionals, do-it-yourselfers, and hobbyists. We understand your needs, so our team works hard to find the best hole saws and more for your needs. After purchasing a bi-metal hole saw from our business, we know that you’ll be happy with your selections. 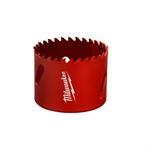 Shop now at USDiamondTool.com and discover the right hole saws for your needs. Bi-Metal Hole Saws are high production tools designed for cutting all machinable materials, including steel, aluminum, copper, brass, sheet metal, stainless steel, wood or plastics. 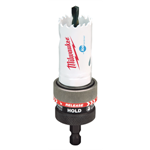 Carbide-Tipped Hole Saws provide longer life and faster cutting. 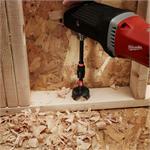 Designed for cutting ceramic tile, flakeboard, fiberboard, fiberglass, and wood. Not recommended for metal. A proprietary cryogenic hardening process improves upon traditional heat treat processes to harden the core by minimizing soft metal and creating more hard metal. The result is a product that is more consistently hard throughout. 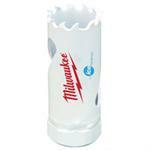 Milwaukee® hole saw arbors are made from hardened carbon steel and alloy steel for greater durability. Pilot bits are designed for long life and durability in abrasive materials.